Sleeping On The Couch! Is It Really Bad? Choosing the right mattress for your sleeping needs can be a daunting task. One important factor to consider while choosing a mattress is your body weight. People who have an above-average body weight need to be more careful when they shop for mattresses. Generally, the best mattress for heavy people nearly has similar characteristics as that in the best mattress for slimmer people but with more support and more firmness. The overweight or heavyweight is a relative term these days. Some people may be considered heavyweight at 150 pounds while others may not be considered overweight at even 200 pounds. We have considered the best mattress for heavyweight people, which provide support for people weighing 230 plus pounds. How Is This Mattress Heavy-People Friendly? The Natures Novel unique design is made to accommodate every sleeper, but it is especially good for heavier people. 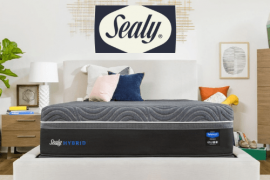 Because the mattress has a very dense 50 ILD base layer, and a 5.1 lb 30 ILD Talalay latex layer on top, it offers just the right mount of needed support while still having enough give to be comfortable. Also, the top cover is made of natural cotton and wool as its fire retardant. It’s also important to mention that this bed sits at 12” high which is the ideal profile for heavy people. Between the durable, dense, firm latex and the natural cotton and wool, there is very little that can go wrong here. These materials will last a very long time and that’s why the mattress comes with a lifetime warranty. Top wool and cotton layer and Talalay latex are naturally breathable which allows much better flow of air for a comfortable and peaceful night’s sleep. Though this is important for every sleeper, it is more important for heavier people to have a cooler mattress. Our team member who is considered heavy tried the medium-soft on his side and was very happy with the feel. 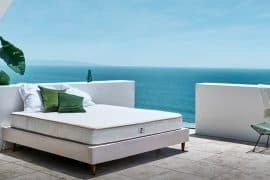 Since both Natures Novel models uses utilize the firm supportive 50 ILD Eco-latex layer, this mattress in the medium-soft feel can actually be very good for a heavy side sleeper. The softness on top will contour to the body and the firmness in the bottom will still support the weight. It is manufactured using natural latex with a natural wool and cotton top layer. Both these materials are breathable which offers natural breathability and freshness. The Latex in this bed perfectly molds to the body shape offering the best support and firmness level while keeping the spine aligned. As latex is a highly durable, and this mattress uses a very dense latex you can expect it to last for years and years. The mattress itself comes with a lifetime warranty. This gives you optimum returns on your investment and removes the worry of what if the mattress can’t handle the test of time. Though innerspring mattresses are known for their lower durability, the DreamCloud is built very nicely and comes with a lifetime warranty to prove that it will last. This mattress consists of 8 different layers of foams and coils and all of them are quality. 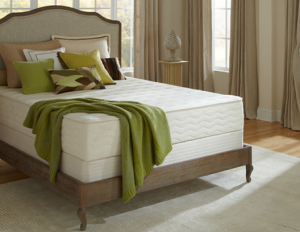 By using both memory foam and latex, this mattress strikes a nice balance of bounce and pressure relief. During our test, we found this bed to be both supportive and comfortable for our heavy weight sleeper. The coil system in the DreamClead hybrid is divided into five different zones with each designed to target a specific part of the body. This coil system also comes with an edge support that most bed in a box mattresses lack. 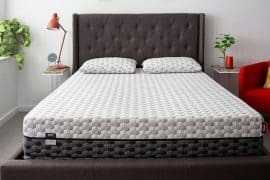 It is good for the heavyweight people who are looking for a hybrid mattress that offers natural latex and memory foam qualities with traditional spring pocket coils feel. It provides targeted support to the heavy body parts while reducing motion transfer. It offers reinforced support that is tailored to the requirements of the body. This mattress comes in 15-inches of thickness and offers outstanding durability. Due to the presence of latex, cooling gel memory foam layer and individual pocket spring coils, it provides wonderful breathability and cooling effect during sleep. the mattress comes with three different choices of latex firmness. The top Dunlop latex layer is soft, followed by a slightly firm medium latex layer and then the firm base. For heavyweight people, the firm layer is recommended for use. Botanical Bliss 12-inch Firm is an eco-friendly organic mattress which aims to provide good night’s hygienic sleep. It is composed of 3 organic Dunlop latex layers which give it a dense and firmer construction. The three layers are interchangeable allowing shifting the firmness as per requirements. This quality alone makes it a good choice for heavy people. Due to the presence of Dunlop latex, it is quickly responsive to pressure removing that feeling of being stuck. This means it provides a support to the overweight people without giving them the sinking feeling. Another characteristic of latex is its coolness and breathability which helps to regulate body temperature. As latex is highly responsive, it makes it easy to roll and change positions for heavyweight people during sleep. Organic Dunlop latex has outstanding durability with its 12’ inches construction thus it comes with a 25 years warranty. It does not lose its shape or permanently sinks due to continuous use by heavyweight people for a long time. 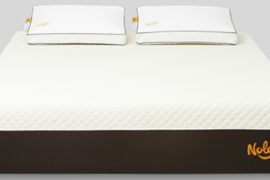 It is a good choice for heavyweight people who want to have a pure organic mattress with customizable firmness levels. It is an all-natural latex mattress with three different layers of Dunlop latex ranging from soft at the top to very firm at the base. It gives a bouncy yet supportive feel to the body with a little sink. For overweight people, the use of the firm side is recommended. We choose this memory foam mattress for the heavy people due to its durability, firmness and strong edge support. This mattress is composed of five layers which provide ultimate firm support to the overweight people. It evenly distributes the weight of the body while channeling excessive heat out of it. Not all types of memory foam mattresses provide the required level of comfort and support for the heavy people. It is highly recommended in the memory foam category because it will not sink too much like other memory foam mattresses. This helps heavyweight people to sleep comfortably during the night and get up easily in the morning. Memory foam can only be recommended for heavy people if it’s very dense. 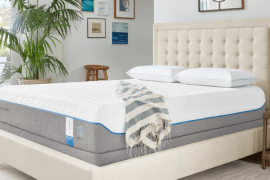 Tempur-Pedic is a very dense mattress that comes with 5 different layers to provide the ultimate level of support and comfort to the sleepers. Good density is what Tempur-Pedic is known for. Also, this mattress is firm with a strong edge support that accommodates heavy people very well. Those heavyweight people who want to enjoy the feel of good classic memory foam mattress with its dense construction can buy this mattress. This memory foam mattress for a heavy person provides the firmness that is required to support heavy body weight during sleep. It helps in even distribution of the body weight making easy to turn and toss during the night. It is a durable memory foam mattress with comes with 10 years repair and replacement warranty. 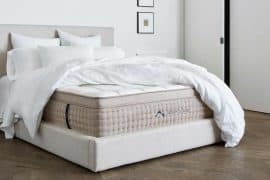 It is manufactured by a very reputable manufacturer Tempur-Pedic which has been in the mattress construction business for about a quarter of a century. So if you are looking for the best memory foam mattress for the heavy or overweight people, Temur-Pedic’s Contour Elite Breeze is a good choice and investment. 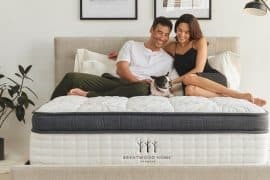 Nectar Sleep might be the least expensive mattress on this list, but it is still a very good mattress that just happened to be inexpensive. 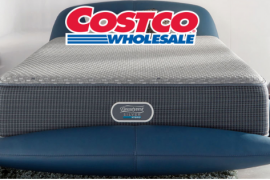 From the cooling Tencel cover to the Gel memory foam and the high-density base foam, this mattress is a viable choice for a heavy sleeper who is on a budget. Both the gel memory foam and the base foam in this mattress are high density. This increases the durability and the support of the mattress for heavier people. Though this bed might feel a little hard for lightweight side sleepers, it is a good choice for medium and heavy weight side sleepers. Nectars confidence in their product is shown in their generous 365-day sleep trial and lifetime warranty. Though you’ll probably not going to need a trial that long, it’s nice to know you have it for a year to see if this bed will have any body indentations by then. However judging by the quality of the materials used, we believe this bed will last a while. The Tencel cover really helps with the cooling and breathability of the mattress. 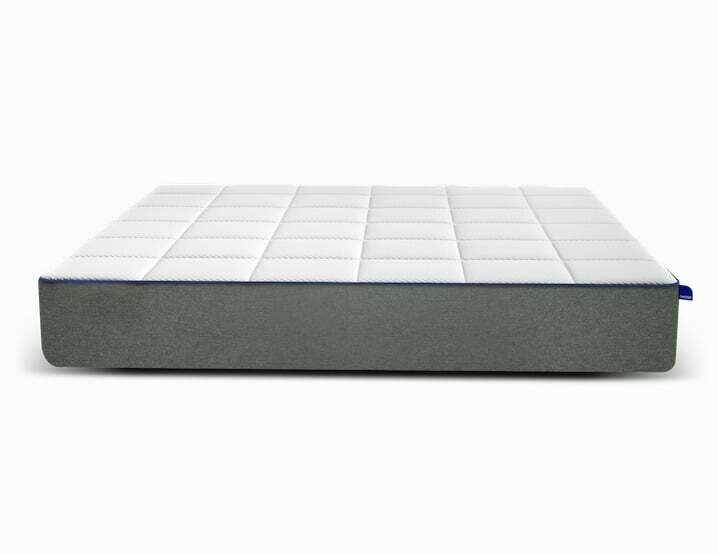 The gel memory foam is responsible for the nice pressure relief that all sleepers need. the 11” profile consists of nice quality materials that can last a long time. Nectar Sleep comes with a 365 day trial. You can use this to see if you like the mattress and also find out if it will lget softer in a year. Nectar also comes with a lifetime warranty for the peace of mind. Which Mattress Is The Best Choice? All the mattresses mentioned in the above list of best mattresses for obese people are designed to provide extra support and comfort for heavier body weights. Each mattress in the list has its own unique qualities and you can choose the one which suits your sleep position, requirements and preferences best. What Makes A Mattress Good For Heavy People? The body weight of the person has a significant effect on the durability and performance of a mattress. It is a surprising fact that more than 50% of people in the US are obese or overweight. Heavy people usually feel comfortable with certain types of mattresses with specific qualities. The most important qualities that the best mattress for obese people should have are thickness, firmness, durability and comfort. Besides these, there are personal preferences according to which an individual chooses a certain type of mattress. There are several mattress types which are considered ‘universally comfortable’, but this does not mean that even these mattresses are perfect for all kinds of people. Obese or heavyweight people should consider some specific qualities when they shop for a new mattress. Generally, the thicker the mattress, the more it costs. The best mattress for obese people should have extra thickness because their weight exerts more pressure on the mattress. This results in the sinking of their body which gives a feeling of hitting the bottom of the bed in case of a thin mattress. People with a body weight of 220 lbs or above should choose the mattress with a thickness of 12 inches or more. Thus, heavier or larger people feel more comfortable on a significantly thick mattress, which provides extra compression, durability and support to their body. The spinal support is necessary for heavyweight people as pressure is exerted on their back during sleep. Thin mattresses do not give that performance expectation which is required for spinal support. The mattress thickness for heavier people should be more. The latest mattresses come with the advanced feature of a high-density layer of comfort foam which gives improved compression support. Irrespective of the mattress type, the foundation support layer in the mattress should have a thickness of 6’inches to support the body weight. Lightweight people do not need that much back support so they can feel comfortable with even thin mattress. Unfortunately, this is not the case with heavy weight people. Due to this reason, we have included the mattresses in this list which are 12 inches thick or more (other than the Zenhaven). On the mattresses with a thickness of 12-inch inch or more, they won’t hit the bottom layer of the mattress quickly and experience back pain. Firmness means how you feel when you lie on the mattress. Mattress firmness is a quite subjective quality because every individual has a different feeling of firmness on the same mattress. Some people tend to confuse the concept of firmness with body support. Firmness actually tells about how the mattress initially feels when you lie or sit on it. A stiff mattress surface is generally known as ‘firm’ while a surface which gives a cloud-like soft feeling is known as ‘soft’. A firm mattress doesn’t resist when it is depressed. It adjusts to your body contours and retains its shape. A less firm or softer mattress makes your body sink down into it. As it has already been mentioned, heavyweight sleepers exert extra pressure and sink down more, naturally in the softer mattress. Heavyweight sleepers need even distribution of weight when they sleep on their back or sides. If they lie on the softer or less firm mattress, they are more vulnerable to developing painful pressure points in their neck, spine, shoulders, and hips. Therefore, mattresses with a medium feel, medium firm feel, and firm feel are recommended for the heavyweight people, depending on their preferences. These mattresses feel more comfortable and provide extra pressure relief for the body weight. If you are planning to buy a foam mattress then it is very important to consider the density of the foam. The density of the foam is the parameter which determines weight support and durability of the mattress. The best memory foam mattress for heavy people should have a higher density as it provides extra support with a longer lifespan. A good density for memory foam is 4lb or 5lb for heavy people. At 4lb or 5lb density, memory foam will be firm, but will also offer good body contouring. It will adjust to the shape of the body, providing support and comfort. As far as regular polyfoam is concerned, a good density is 2.0lb. This polyfoam density will last longer and perform better for most heavyweight or obese people. The steel coils thickness or the gauge used in the hybrids or pocket spring mattress could also help choose the supportiveness of the mattress. Just like foam density, a thicker coil is also a good component to consider which makes a mattress good for heavy people. The mattress coil gauges are presented in numbers which generally ranges from 12 – 18 in thickness. The 12 is thickest while 14 are thinnest. The recommended coil gauge for heavy people is 12 to 14 max. These offset coils usually have a lower coil gauge while pocketed spring coils have a higher coil gauge. The pocketed coils are a good choice as they will provide excellent firm support and durability to heavy bodyweight, but anything higher is not recommended. The spring mattresses in our list have pocketed spring coil which means higher gauge and better support. Heavier people often feel hotter while sleeping due to their heavy body mass as compared to thin people. It is because their body tends to generate more heat. The material of your mattress plays a significant role in this regard. 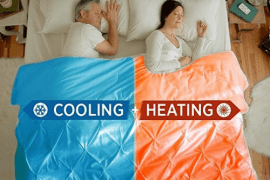 Some types of mattresses retain heat while others allow better airflow, retain less heat and even come with a cooling layer that regulates the body temperature. Thus, it is essential for heavyweight people to find a mattress that offers a cooling technology because if breathability is an issue no amount of comfort will be enough. Most natural latex mattresses and some form of memory foam mattresses offer excellent breathability. All the best mattresses for obese people which we have mentioned in our list provide brilliant breathability and cooling effect for a comfortable and cool sleep. Edge support means how well the mattress creates reinforcement surrounding its perimeter. For a larger sleeper, it very important to use 100% of the sleeping surface or they might feel like rolling out of the bed when sleeping on the edge. A good edge support provides a better, consistent and entire surface to sleep, especially in case of heavy weight people. It also provides support to easily get in and out of the bed while sitting on the edge when you get ready in the morning. That’s why good edge support is necessary. Hybrid and innerspring mattresses typically offer better edge support as compared to the memory foam and latex mattresses. Best mattresses for overweight people mentioned in our list offer sufficient edge support for easily moving in and out of the bed. To have peace of mind, a good non-prorated mattress warranty is necessary. It ensures that if the mattress starts sagging there will be a warranty backing the mattress. When you compare the mattresses before buying, always take the trial period of the manufacturer in consideration. Make sure that it should not be less than 30 nights. 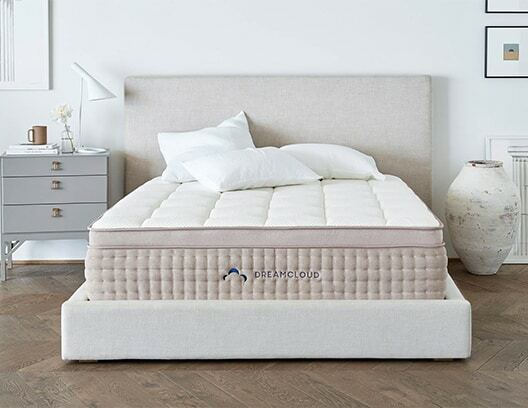 Most of the reputed mattress manufacturers provide a convenient 100 plus days trial period to test the quality, comfort and durability of the mattress. The trial period with money back warranty may range from 40-120 nights. The warranty of the manufacturer should also provide protection against the mattress’ premature sagging or excessive sinking, any indentations and any other defects. Any type of mattress will sag, sink or indent with the passage of time but it should not happen in just a few years of usage. So if all these conditions occur early, a warranty should provide coverage for them. The well-known and leading mattress manufacturers generally provide a warranty of 10 or 20 years or a lifetime replacement warranty for their mattress. This ensures that you get the best and optimal return on your valuable investment. However, before you buy the mattress understand the terms and conditions of warranty and specifically inquire about the sinking and indentation, if it occurs. The company should consider these conditions as an issue in their product and should offer coverage for it. In most of the warranties sagging or sinking of 1- 1.5 inches depth is covered but this varies from the manufacturer to manufacturer and type of mattress. So you should be clear about these things before buying. In addition to defects warranties, you should also notice the repair or replacement costs and respective conditions. In some warranties, the owner is required to handle shipping costs for repair or replacements which may cost around $100-$200. However, this varies from company to company. Some manufacturers may not charge shipping for repairs or returns. Therefore, you should investigate it from the company you are buying the mattress to remove any ambiguities and problems later on. All the best mattresses for overweight people in our list come with a long warranty period, ensuring that you have a mattress with high durability and your investment will not go to waste in a short span of time. What Is the Best Type of Mattress For Heavy Sleepers? There are many types of mattresses available in the market. However, for heavy sleepers, there are only certain types of mattresses that can prove useful. These mattresses tend to provide better support and comfort to the heavy body mass while allowing easy airflow for cooling effect. 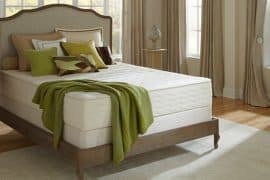 Here is an overview of some of the mattress types to help you decide about the best mattress type for heavyweight people. Latex mattresses are in first place as they have almost all the necessary features needed to support a heavy sleeper. Latex mattresses have become highly popular in the past few years. It is primarily because these are made from organic latex material that provides natural qualities. These mattresses offer layered support with dense and firm latex top layer combined with 1 or more layers of softer latex material. The latex conforms to the body contours, offers pressure relief similar to that of foam mattress and provides support with more conventional hybrid or innerspring mattress feeling. Latex comes first as the most recommended type of mattress for heavy sleepers because of its durability, cooling effect, breathability and natural qualities. The cost of a queen-sized latex mattress usually ranges from $800 to $4,400. Though they are considered expensive, they are worth the price as they last the longest. Latex provides contoured pressure point relief to heavyweight sleepers for comfortable sleep and body support. There are several firmness levels available in latex mattresses. Some even offer 2 different comfort levels in a single mattress, like Zenhaven Latex mattress. It gives a much cooler and breathable feel as compared to many foam mattresses. As latex mattresses use natural material, these are a bit more expensive than regular memory foam mattresses. Latex mattresses are known for their heavyweight. This makes them a hassle to move. In the second place, Memory foam mattresses have become popular due to their customized feeling and support level which they provide to sleepers. Originally, NASA invented the memory foam to offer protection against a crash. It changes according to the shape of the body and offers considerable support. Its support base is made up of high-density and quality polyfoam. This base is layered with memory foam, which comprises nearly 25%-45% of the mattress. While choosing the memory foam mattress for heavier people, consider the mattress with at least 12-inch thickness. This mattress offers the best body pressure relief and contouring for heavyweight sleepers. Memory foam mattress provides enhanced motion isolation, which prevents disturbance to your partner. High-quality memory foam mattress is highly durable which lasts for decades. The memory foam mattresses generally trap heat unless some kind of cooling technology is used for a cooling effect. A thin memory foam mattress gives a sinking feeling which is not suitable for heavy bodyweight sleepers. If you have a tight budget which prevents you from buying an organic latex mattress, then you can go for a memory foam mattress. Third, Hybrid mattresses have a similar coiled supporting system which is found in the innerspring mattress underneath a thick memory foam or latex layer. Hybrids are half pocketed coil and half memory foam or latex. 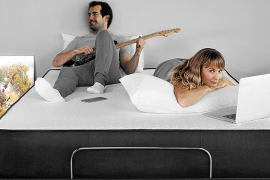 The comfort layer of the hybrid mattress is at least 2’inches in thickness. This feature makes it different from the innerspring mattresses. A hybrid mattress gives pressure relief and body support, which is more similar to that of traditional innerspring mattress feel. However, hybrids occupy the third place because coil mattresses generally don’t have the much-needed durability that heavy sleepers require. The price range for hybrid mattresses is generally between$600 to about $4,000. The price depends primarily depends on the kind of coils used, their gauge, the system of support and kind of foam used for comfort layer. They also are somewhat pricey, but the cooling they offer is excellent. Some hybrid mattresses like the ones in this list are equipped with high-quality coil system to increase the longevity of the mattress. Heavy sleepers can take advantage of the pressure relief and body support qualities of hybrid mattresses. It does not trap heat and gives a cooling effect due to the presence of coils in it. 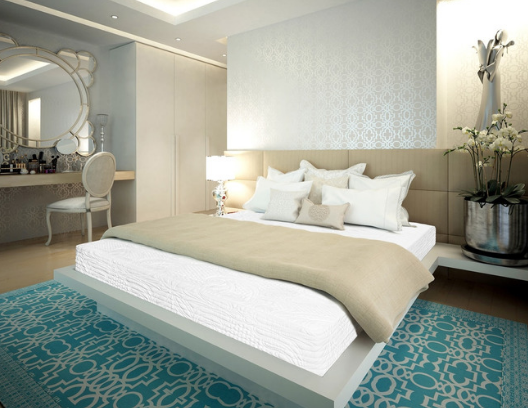 It offers enhanced motion isolation qualities as compared to the innerspring mattress. Since hybrid mattresses use the coil system for support, these are susceptible to sagging at some point. These are expensive mattresses as compared to other types of mattresses. Innerspring mattresses achieve a last position for the larger and heavyweight sleepers because they provide the lowest durability, pressure relief, and comfort. However, due to their low price people often end up buying these mattresses. The innerspring mattresses are made primarily of spring coil or steel coils. The thickness of these coils varies ranging from 12 to 18 gauges which determines the durability and support level of the innerspring mattress. This type of mattress is available in a wide variety of options. The coils used inside these mattresses are often cushioned and well encased inside a soft quilted fabric. Then the network of springs is layered with two or less than 2 inches of top comfort layers. These layers can range from cotton to memory foam and latex. The price of the innerspring mattress for the queen-sized bed may range from $800-$1,200. If budget is not a very big issue then you should avoid buying these mattresses as they are not very suitable for heavyweight sleepers. This is why we don’t have a single recommended innerspring mattress in this list. It comes in a verity of firmness range so you have a choice according to your needs. There is lots of space between the coils which allows easy flow of air and provides ventilation. This enables the body heat to escape, giving a comfortable and cool sleep. The edge support of innerspring mattresses is much better than other mattresses. For heavyweight sleepers, sagging of the mattress could be an issue. The innerspring coils are not good at preventing motion transfer. So if you share a bed with your partner, you are likely to notice each other’s more pronounced movements as compared to other types of mattresses. Also, remember that an innerspring mattress for heavy sleepers is not very durable. It means that it might cost you more in the long run. The worst thing about an inappropriate mattress is that you might not be able to differentiate and realize the differences until you have another one to compare. If you are a heavyweight person or suffer from morbid obesity, this can be an even worse condition. A bad mattress choice can cause different health problems including backaches, shoulder and neck pain, insufficient support and rising body temperatures while sleeping. All these conditions can contribute to worse night’s sleep. On the contrary, if you take some time out to do research and read the provided information before buying the best mattress for obese people, you can buy something that will provide you ultimate comfort and support during sleep. The choice of right mattress will not just help eliminate your neck and lower back pains, but it could also give you better and cool sleep through its temperature regulating qualities. This will make your whole sleeping experience much more comforting and enjoyable. You will get up feeling fresh and energized rather than feeling painful and lethargic. Additionally, the good support system in these mattresses will provide support to your body during sleep. This helps you in improving your physical posture, the health of your muscles and even lifts up your mood! 12’ inches or more in thickness. Provide outstanding deep compression support. Provide a medium to firm feel. Gives excellent support to your lower back, neck, and spine. Due to their construction and combination of materials, heavy body weight sleepers sleep cool and comfortable. These come with adjustable foundations. These mattresses offer a long warranty period which gives you the best value on your investment. You can easily buy them online. With all these factors in view, we have compiled the above-mentioned list of best mattress for overweight people. It is based on our own personal experience and we hope that it will help you decide which mattress to buy within your budget for heavy people. We may receive a referral fee each time a consumer uses a link or code on this website to purchase a product with, for more info visit our disclosure page. After years of not sleeping well and not finding the right guide for natural products online, she decided to do the research so others don’t suffer when buying a new mattress as she did. For the past 3 years, she studied everything about sleep and natural product to put the best natural mattress buying guide online. © 2018 Right and Reserve by Top Natural Mattress.